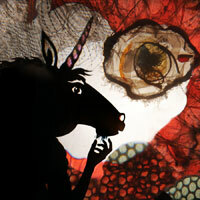 Curious Contagious is a creative, original and clever story, told by using shadow puppets, costume pieces, and slides. The accompanying original music is well-recorded, and adds to the overall ambiance and feel of the piece. Both of the puppeteers are incredibly talented, and have created a fascinating and unforgettable shadow world. A real treat, this show should not be missed!